Winter can be daunting when you have a new baby to care for. The thought of going out in the cold and ice is bad enough, but then you have to deal with chapped lips, runny noses, flu warnings, SIDS warnings – the list goes on and on. Here are a few products to help make the winter months just a little easier! *Car Seat Cover – Since baby won’t be wearing a bulky jacket while in the car, a car seat cover is a great way to keep baby warm without anything getting in the way of the straps. There are many different options for these. Pick something that has been tested with your brand of car seat. (Many car seat manufacturers have their own tested models.) It should be something that fits securely over the top of the seat so it does not interfere with the strap system. We recommend The Cozy Cover. The Cozy Cover is a warm and soft infant carrier cover that protects your baby from all the elements such as rain, snow, wind, as well as unwanted touch, and more! *Stroller Muff & Cover – Much like the car seat cover, these help cover baby and keep him/her warm and protected while in the stroller for an easy in and out option. *Stroller with Snow Tires – Some strollers are definitely better than others on slushy sidewalks. Check your favorite brand for their winter options. *Extendher – Don’t want to deal with a bulky stroller in the winter? Use your favorite baby carrier and add an extendher to your jacket. Now your favorite jacket can keep your baby warm too, while offering you the convenience of having your baby right within easy reach at all times (and your hands free!). It can also be used during pregnancy to expand any of your favorite coats and jackets, avoiding that expensive maternity coat purchase. *Hats/Gloves/Booties – Be sure that your baby has a warm hat, gloves, and booties on before heading out the door. Once inside, take these off to make sure (s)he doesn’t get overheated. For gloves, we recommend Snow Stoppers. These fantastic gloves are super warm and have an extra long cuff to go over the coat to prevent snow from creeping in. If your baby is notorious for pulling off hats, try a baby Balaclava. This is a head cover that covers the entire head and neck, while keeping the whole face area clear and the cover in place where it should be. *Hand Sanitizer – Washing hands with soap and water is your best option, and staying away from indoor “hotspots” before baby is properly vaccinated is recommended, but if you do need to go out, have a hand sanitizer handy for you to at least get some of the germs off when you can’t make it to a sink before touching your baby. Most hand sanitizers contain harsh chemicals, though, so go for ones with a mix of more natural ingredients that will be safer both for you and your baby. *Snowsuit – As an infant, you don’t really need a snowsuit since babies are not supposed to wear jackets or bulky layers in the car seat. An extendher for your jacket gives baby all the warmth she/he needs to get back and forth. 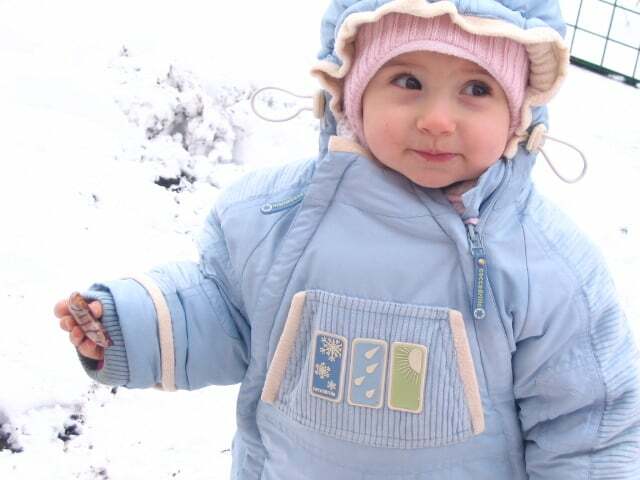 But once they hit toddler ages, a one piece zip-up snowsuit is a great way to keep baby warm outdoors but to also be able to easily slip it on and off. *Flannel Sheet – Blankets or other loose objects in the crib are not ok, but you still want your baby warm and cozy at night. Having a tight-fitted warm flannel sheet on the mattress will help. *Footed Pajamas – Dress your baby in warm flannel footed PJs to give them full coverage and a soft cozy feel. For those extra cold nights, add an undershirt onesie for an extra layer of warmth. *Sleep Sack – Since blankets are a no-go in the crib, after dressing your baby in warm PJs, add a sleep sack in place of a blanket. This is almost like a wearable sleeping bag. There are no sleeves and it zips up the front so there is nothing for the baby to get caught in like with a blanket. Try out our favorite brand, HALO. *Are chapped cheeks, lips, and noses an issue? Use skin care products with natural ingredients and little to no added chemicals. Products with calendula, shea butter, and oatmeal are great for healing and soothing dry winter skin. Try unpetroleum jelly for protecting skin against the cold. *Soaps can also be very irritating, especially in the winter. Baths are not needed every day, but when it’s bath time, use an organic soap without harsh fragrances or additives. Try to stay away from soaps (or other products) that contain phthalates and parabens. *If baby does have a stuffy nose or dry breathing passages, a humidifier can help. Don’t position directly next to the crib, and if it is a steam one, be sure it’s out of reach from your child since the humidifier can get very hot. *Room Thermometer – While your house’s thermostat gives an approximate temperature, each room can vary in its actual temperature. It is best to keep baby’s room at a more moderate temperature (65-68F is ideal). Having a room thermometer will ensure that your baby’s room is at the ideal temperature to keep your little one safe!